Concept of a myofascial continuity, also known as a myofascial chain. Permission Joseph E. Muscolino. Kinesiology – The Skeletal System and Muscle Function, 3rd ed. (Elsevier, 2017). Frieder Krause and colleagues from Department of Sports Medicine, Goethe University in Germany published a review in the June 2016 issue of Journal of Anatomy to provide evidence on tensile transmission along a myofascial meridian, also called myofascial chain or anatomy train, based on anatomical dissection studies and in vivo experiments. As evidence for the existence of myofascial chains is growing, and the capability of force transmission via myofascial chains has been hypothesized. However, there is still a lack of evidence concerning the functional significance and capability of force transfer along these continuities of myofascial tissue. Systematic literature research was conducted using scientific publication databases. The study included myofascial chains of the superficial backline (SBL), the back functional line (BFL) and the front functional line (FFL). 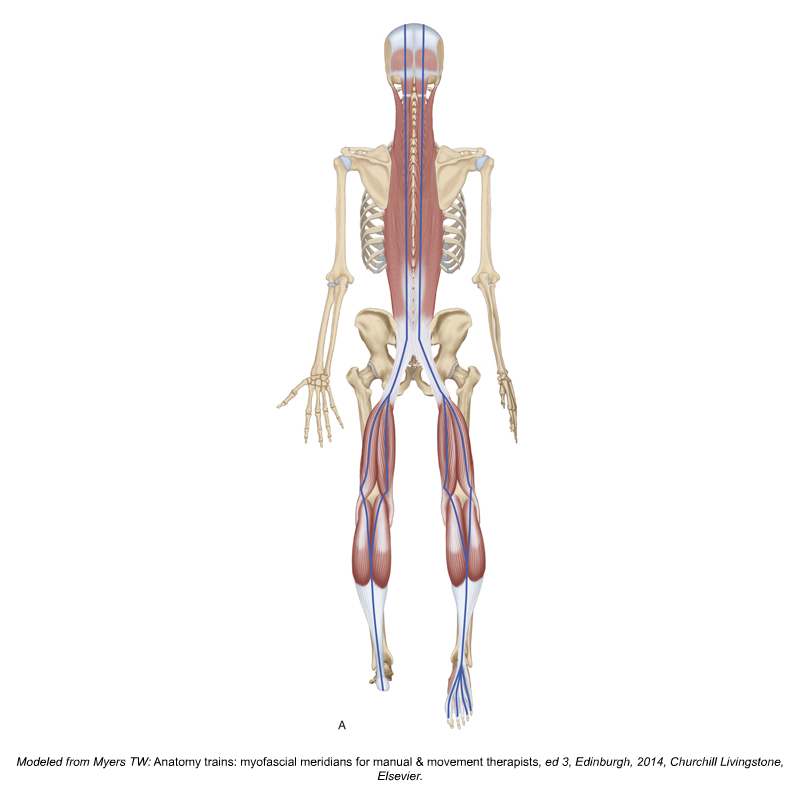 Peer-reviewed human dissection studies as well as in vivo experiments reporting intermuscular tension transfer between the constituents of a myofascial chain were included. To assess methodological quality, two independent investigators rated studies using validated assessment tools. The literature research identified 1022 articles. Nine studies (moderate to excellent methodological quality) were included. Superficial Back Line myofascial chain. Permission Joseph E. Muscolino. Kinesiology – The Skeletal System and Muscle Function, 3rd ed. (Elsevier, 2017). Modeled from Tom Myers’ Anatomy Trains art. The Superficial Back Line (SBL) myofascial chain connects the foot to the head via plantar fascia, Achilles (calcaneal) tendon, gastrocnemius, hamstrings, sacrotuberous ligament, thoracolumbar fascia, paraspinal erector spinae musculature, trapezius, occipitalis, galea aponeurotica, and frontalis muscle. Thus we have a continuity from the bottom of the feet to the forehead. Two studies reporting force transfer between the plantar fascia and the Achilles tendon were found (moderate evidence). One trial identified force transfer between pelvic motion/hamstring movement and gastrocnemius muscle (moderate evidence), and three studies demonstrated force transfer between the hamstrings and the sacrotuberous ligament or the thoracolumbar fascia, respectively (moderate evidence). Thus we have moderate quality evidence that would link the plantar fascia all the way up to the thoracolumbar fascia, so at least the lower aspect of the Superficial Back Line myofascial chain seems to have corroboration according to these studies. Back and Front Functional Line myofascial chains. Permission Joseph E. Muscolino. Kinesiology – The Skeletal System and Muscle Function, 3rd ed. (Elsevier, 2017). Modeled from Tom Myers’ Anatomy Trains art. 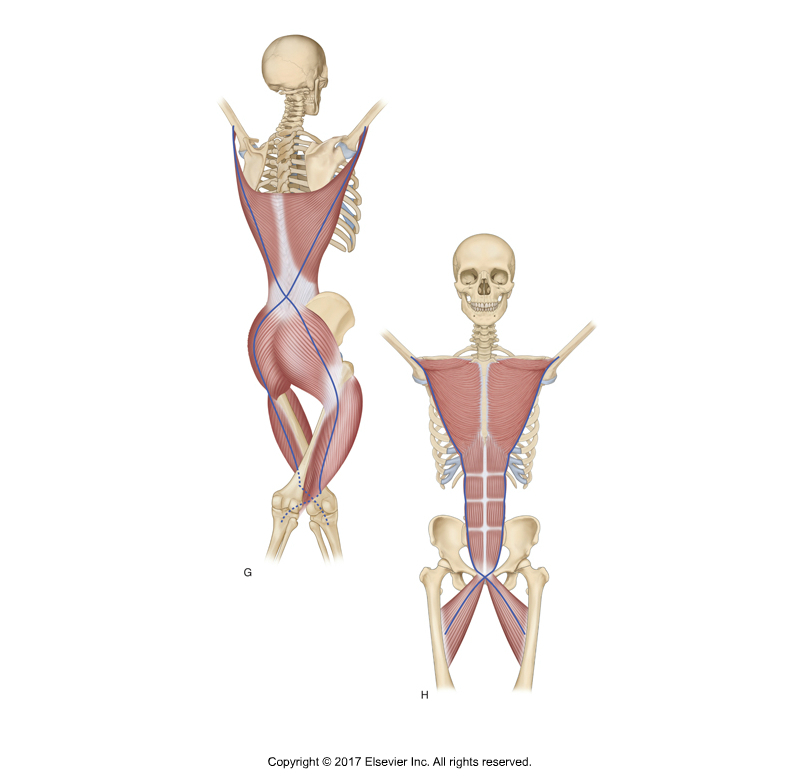 The Back Functional Line (BFL) myofascial chain according to Tom Myers begins with the latissimus dorsi, connects into the lumbosacral (thoracolumbar) fascia and crosses over to the gluteus maximus contralaterally (on the opposite side). It continues into the iliotibial band and vastus lateralis muscle on the lateral thigh. Thus we have a continuity from the latissimus dorsi on one side of the body to the lateral thigh contralaterally. No study stating force transfer between the gluteus maximus and the vastus lateralis was found (no evidence). In contrast, three studies reported force transfer between the latissimus dorsi and the contralateral gluteus maximus, respectively, and the tensor fasciae latae (TFL) (moderate evidence). Thus we have moderate evidence, according to these studies, of a continuity from the latissimus dorsi to the contralateral gluteus maximus and TFL. The Front Functional Line (FFL) myofascial chain according to Tom Myers begins with the pectoralis major and its connection to the lower ribs, where it has myofascial continuity with the rectus abdominis to the pubic bone and down into the lower extremity via the contralateral adductor longus. One study reported transmission of force between the adductor longus and the contralateral distal rectus sheath, which turned out to be non‐significant when compared with baseline values (moderate evidence). No study examining tension transfer between the rectus abdominis and the pectoralis major muscle was detected. Thus, here, according to these studies, we do not (yet?) have confirmation of a continuity along the Front Functional Line myofascial chain. One possible explanation for the lack of corroboration of the front functional line (and indeed all “functional” line) myofascial chains could be that functional lines by definition, come into play and transfer force only during certain “functional movements.” Indeed, Myers states: “These lines are called the ‘functional’ lines because they are rarely employed, as the other lines are, in modulating standing posture. They come into play primarily during athletic or other activity where one appendicular complex is stabilized, counterbalanced, or powered by its contralateral component.” This is acknowledged by the authors of the study (see final paragraph). In fact, given this, it would seem to make more sense logistically for anatomical studies to first focus on the “structural” line myofascial chains that are not dependent on functional movements/positions that are outside of anatomic position. Then attention can be given the functional myofascial chains. Did you know that Digital COMT (Digital Clinical Orthopedic Manual Therapy), Dr. Joe Muscolino’s video streaming subscription service for manual and movement therapists, has six folders with video lessons on Manual Therapy Treatment, including an entire folder on Stretching, as well as a folder on Pathomechanics and another on Anatomy? Digital COMT adds seven new video lessons each and every week. And nothing ever goes away! Click here for more information. 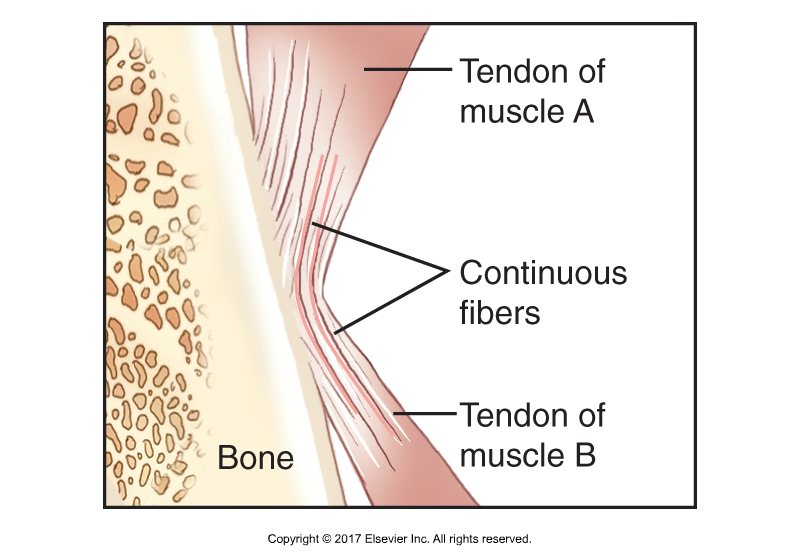 The findings of this study indicate that tension can be transferred between some of the examined adjacent structures along myofascial chains (myofascial continuities). The results also confirmed some of the in vivo studies. For example, ankle ROM can be affected by forward head posture, passive hamstring stretching tended to increase cervical spine range of motion, self‐myofascial release on the plantar fascia increased sit‐and‐reach performance, and ankle range of motion can be affected by hip position. These findings encourage the consideration of the entirety of myofascial chains in the strength and flexibility training. However, the authors also acknowledged that different methods of force application and measurement hinder the comparability of results. Considering anatomical variations in the degree of continuity and histological differences of the linking structures is crucial for interpretation. Future studies should focus on the in vivo function of myofascial continuity during isolated active or passive tissue tensioning. Stretching the hamstrings. Figure B is a self-care stretch for the hamstrings that can be used as an exercise to demonstrate the myofascial continuity of a myofascial chain. Permission Joseph E. Muscolino. The Muscle and Bone Palpation Manual – with Trigger Points, Referral Patterns, and Stretching, 2nd ed. (Elsevier, 2016). There is a very simple exercise you can do to illustrate the continuity in the Superficial Back Line (SBL) myofascial chain between the gastrocnemius and hamstring musculature. Sit on the floor in a position to stretch the hamstring musculature, with your thigh out in front of you flat on the floor and the knee joint fully extended with the (lower) leg flat on the floor. Now reach forward by anteriorly tilting the pelvis at the hip joint. This stretches the hamstrings because they are posterior tilters of the pelvis at the hip joint. Note how far you can reach. Now relax the stretch position and repeat with plantarflexion of the foot at the ankle joint and repeat with dorsiflexion of the foot at the ankle joint. Note how plantarflexing the ankle joint increases your hamstring stretch range of motion; and how dorsiflexing the ankle decreases the hamstring stretch range of motion. The hamstrings to not cross the ankle joint, so this shows that there must be a continuity between the hamstrings and musculature that moves the ankle joint, in this case, the gastrocnemius. Simply put, dorsiflexing the ankle joint stretches the gastrocnemius, which then exerts its tension force into the hamstrings, increasing its stretch across the knee joint, thereby limiting its ability to stretch across the hip joint, thereby decreasing the range of motion stretch of the hamstrings. Conversely, plantarflexing the ankle joint decreases the stretch on the gastrocnemius, which decreases its stretch on the hamstrings, which allows for greater hamstring stretch across the hip joint, and therefore greater range of motion stretch.